One of the world’s most magnificent apartment buildings, 998 Fifth Avenue was designed by McKim, Mead & White, the architectural firm that designed the Pennsylvania Station that was demolished in 1964. An inflated Italian Renaissance-style palazzo structure, the building would delight the Medicis and is widely credited with convincing New York’s very rich that apartments were acceptable habitats. "At the time 998 was built, apartment house living had not yet been widely accepted by the very wealthy, but as The Real Estate Record noted, 998 helped to change the 'deep-seated repugnance' that 'families of high social position' had for apartments," noted Andrew S. Dolkart in his fine book, "Touring the Upper East Side, Walks in Five Historic Districts," published in 1995 by the New York Landmarks Conservancy. Although only 12 stories tall, its limestone rustication, yellow Sienna marble panels on the 8th and 12th floors and large cornice topped by a pitched, cooper roof convey a marvelous sense of monumentality. Almost square, the building has a large inner court on which only servants and service rooms faced, but the court was lined with stone rather than brick to improve the view. 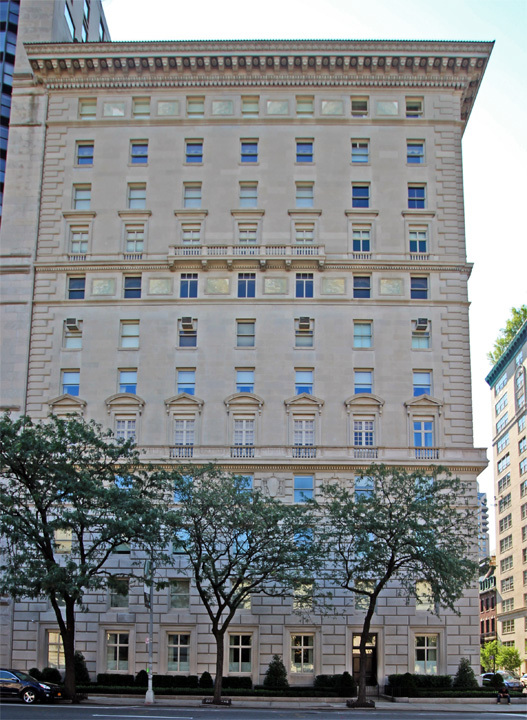 When it opened as a rental in 1912, the building stood as an isolated and not necessarily popular tower along Millionaires' Row on the avenue until Douglas I. Elliman, the rental agent in his older brother’s real estate firm, Pease & Elliman, convinced Senator Elihu Root to move from his Park Avenue home at 71st Street by reducing his rent from $25,000 a year to $15,000. 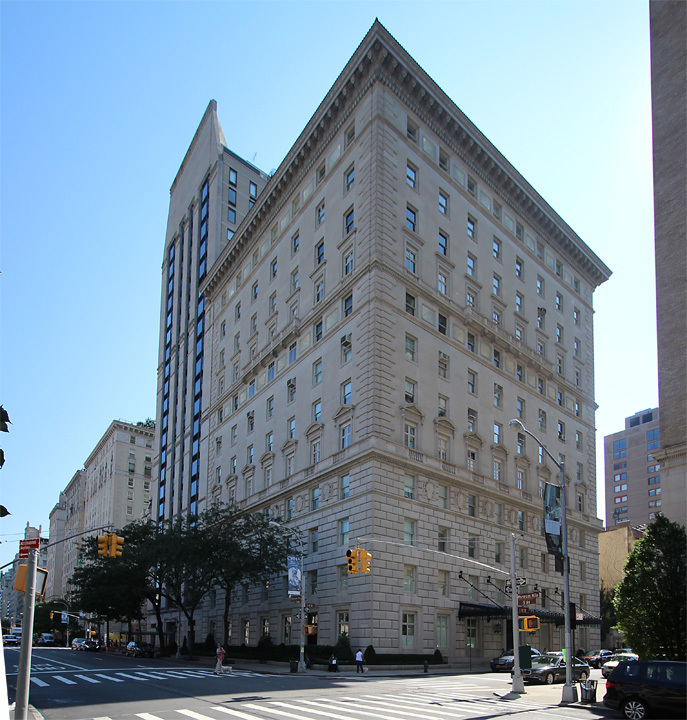 After loss-leader Root signed up, the building filled quickly with such residents as Murray Guggenheim, former U.S. Vice President Levi P. Morton and a granddaughter of Commodore Cornelius Vanderbilt. 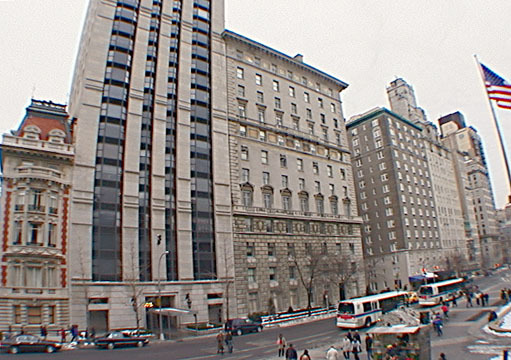 The building was developed on a site formerly owned by August Belmont II, the financier who was involved in building subways, by Century Holding Company, headed by lawyers Charles R. Fleischmann and James T. Lee. It was converted to a cooperative in 1953. In 1974, the city’s Landmarks Preservation Commission finally got around to designating it an official city landmark and described it as the city’s "finest Italian Renaissance-style apartment house." Andrew Alpern noted in his book, "Historic Manhattan Apartment Houses," (Dover Publications, Inc., 1996), that the building has a "central vacuum-cleaning system, jewelry and silver safes anchored in the walls of each apartment, remote laundries with ventilated steam-drying devices, basement storage rooms, refrigerated wine cellars and additional servants’ quarters...." The handsome, large marquee over the side-street entrance still exists, although it has lost some of its decorative elements as Alpern noted and illustrated in his book. "The lobby was lined in Italian marble, the halls were floored in durable Tennessee marble (like Grand Central Terminal), and the elevators were paneled in French walnut. Some doors throughout all apartments were framed in marble, and each front door was fireproofed with a sheet of galvanized steel that was painted to simulate fine wood. Ceilings measured ten and a half feet high, except on the fifth floor, where they were a foot higher. The interior design of 998 provided three apartments for every two stories, which added up to six duplexes, located in the advantaged southern corner, and eleven seventeen-room simplexes," wrote Elizabeth Hawes in her book, "New York, New York, How the Apartment House Transformed the Life of the City (1869-1930)," Henry Holt and Company, 1993). Stanford White, the legendary partner of the architectural firm, had been killed a few years before this project, but the firm obviously still had plenty of genius left and William Richardson, a partner in the firm, was responsible for this design. The building is a very elegant masterpiece. When it was erected, the Metropolitan Museum across Fifth Avenue was much, much smaller than its present configuration and attracted far fewer hordes. 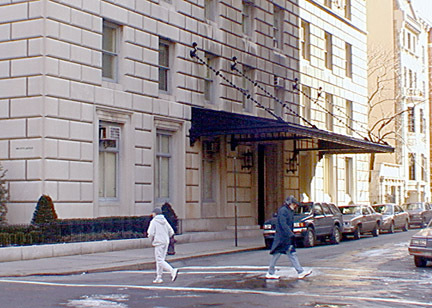 When Peter Kalikow, the developer and publisher for a few years of The New York Post, erected the adjoining, mid-block apartment tower at 1001 Fifth Avenue, his architect, Philip Johnson, made some contextual gestures towards 998 Fifth Avenue by using a limestone facade and matching up some of its bandcourses. That tower's base is actually quite restrained and elegant, but its famous "billboard," propped up roofline has been broadly scorned as a filmsy insult to the grandeur established by 998 Fifth Avenue. This building is not perfect, of course, at least by modern standards as it does not have a rooftop health club and swimming pool, nor a garage, nor balconies. It does, however, have a lot of class. "Maintenance of a cornice is not for the faint-of-heart, nor its reconstruction for the small-of-purse, but when done right, the result can be spectacular. Witness the magnificent total reconstruction of the complex classical cornice on the McKim Mead & White masterpiece 998 Fifth Avenue at 81st Street. It was built up originally of multiple terra-cotta elements on steel supports, but a century of infiltrating water had rusted the steel, which expanded and cracked the fired-clay stones. Robert Bates of Walter B. Melvin Architects devised a stainless steel system to support newly-crafted high-quality terra-cotta stones (replicating the originals) that were glazed to match the beautifully cleaned and restored limestone facade of the building. The handsome cornice was crowned with a copper-tile roof that recreates the long-lost original."